We've had a spate of branding projects this month. Here's another one we would like to share. It's for a great new bike and activity park in Hillcrest - for kids and adults. Freedom Trails bike and adventure park. The client wanted something fun and modern but simple and youth-targeted. As you can see from the first concepts, the brief wasn't 100% established, nor was their title. 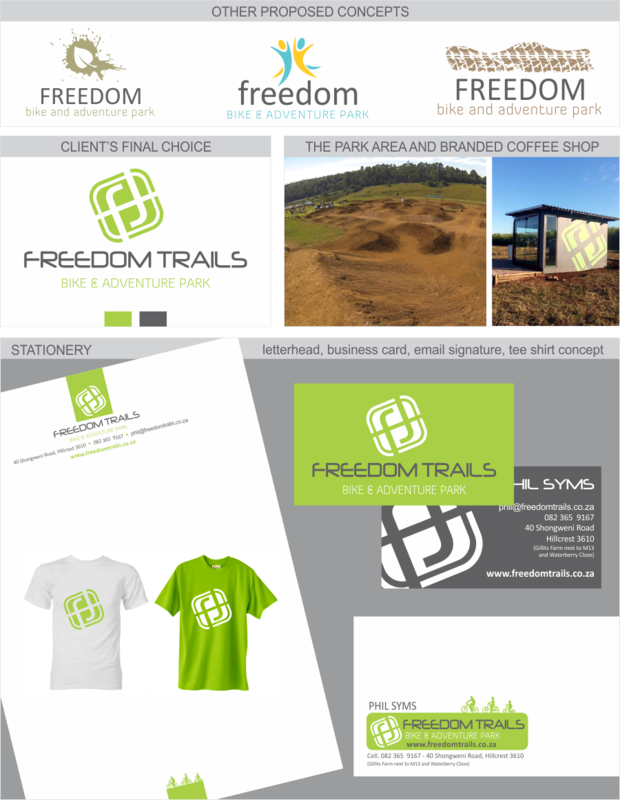 Then the client refined what they were after: to use the title Freedom Trails, and incorporate the F and T into an abstract-type logo with a similar feel to surfing or skateboard brands. It was a small challenge coming up with something that hadn't been done already but apparently we nailed it because the client loves the final product. It's a simple single-colour mark that is easy to remember and can be extremely versatile. Have a look at the project summary below. If you have kids make sure you watch the Freedom Trails Facebook page for upcoming progress and events. And make a trip to Freedom Trails for a cup of coffee while your lighties have a blast on the most awesome track!